The first signs of spring bring cravings for fresh greens and salads. From chickweed to lambs quarters to lettuce and kale, fresh greens provide our bodies with much needed nutrition and cleansing after the winter months. Asparagus crowns delight the senses as they rise to the spring sun from their winter dormancy. Blooming strawberry plants bring much anticipation and those initial, delicious fruits usher in the true sweetness of spring and with one taste, we are smitten. Whisk together dressing ingredients in a small bowl and set aside. Steam or sauté asparagus or leave fresh. 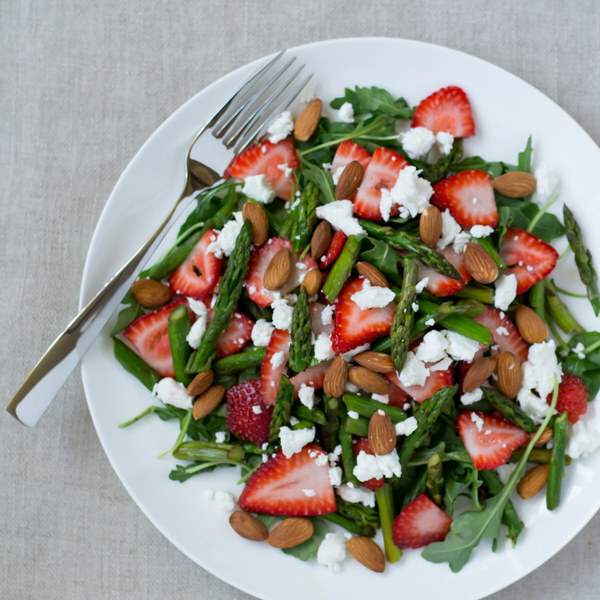 Mix arugula, strawberries, asparagus and spring onions together in a large bowl. Toss salad with dressing and top with goat cheese and nuts. Serve immediately. Enjoy!